Abbas's Fatah firing not only on Jews but also at each other in Jerusalem area; lawlessness deepens with prevalence of illegal arms. In parallel to the so-called "silent intifada" of rock and firebomb terror plaguing Jerusalem, incidents of gunfire in Judea and Samaria have been sharply increasing in recent months, following Palestinian Authority (PA) Chairman Mahmoud Abbas's Fatah faction's declared "return to terror." That announcement, which was made by Fatah's "military wing," the Al-Aqsa Martyrs' Brigades, has led not only to an outpouring of attacks on Jews but also apparently to shootings between rival members of Fatah. Fatah activists were ambushed this Wednesday in a hail of gunfire in the Arab town of Beit Duqqu, located in Samaria just to the northwest of Jerusalem. The Fatah members who were fired on had taken part in a meeting to discuss disagreements in the organization regarding priorities for "action" in the Jerusalem area. One of them told the Palestinian Arab Safa news agency that additional gunfire targeted their car as it passed adjacent to the Arab town of Al Jib, also located to the northwest of Jerusalem, and that residents told them another shooting ambush was waiting for them in the village of Beit Nabala. In a separate incident a week ago, Fatah members were similarly shot at in the northern Jerusalem neighborhood of Shuafat. 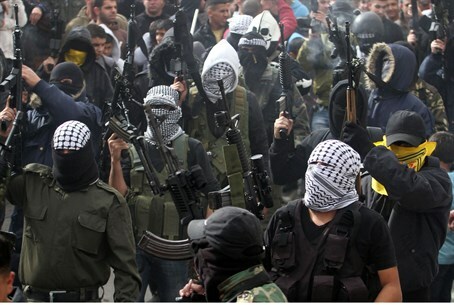 Aside from showing the lawlessness of PA-managed areas, the incidents bear stark witness to the prevalence of illegal weapons among Fatah terrorists in Judea, Samaria and Jerusalem. Another example of the prevalence of arms was seen recently in the Kafr Aqab neighborhood of northern Jerusalem, where Fatah terrorists were filmed firing automatic weapons in the air, ostensibly as a warning to drug dealers and "collaborators" with Israel. Hamas has also been getting in on the action; another video last month shows terrorists with Hamas headbands shooting at an IDF Border Patrol post with modified sub-machine guns in Jerusalem's Shuafat neighborhood. The ongoing violence against Jews in Jerusalem has also included countless rock, firebomb and firework attacks, including a recent assault on a infant day care center in Ma'ale Hazeitim on the Mount of Olives in Jerusalem this week. The breakdown of law comes after Jibril Rajoub, senior PA and Fatah leader and confidante of Abbas, on PA TV said his organization had made a "political decision" not to stop anyone from "slaughtering" Jews in eastern Jerusalem, Judea and Samaria. Shockingly, Israeli police have been revealed to be hushing up Arab terror in Jerusalem, as Jerusalem Mayor Nir Barkat urges the media to stay quiet on the topic in order to avoid potential harm to local tourism.